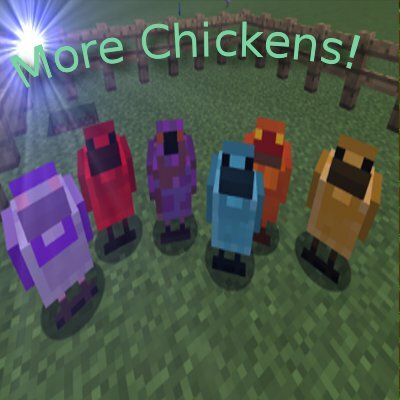 You know what would be awesome, Gaia spirit chickens from botania. It would be a bit game breaking but they could be really difficult to obtain. One other mod you should add is the Natura Mod. I would also suggest to add all the other kinds of wood for the base game as well. is this mod and animania compatible? If you mean do they play nice together, yes. But one is more realistic and the other is not. I'd like to see a Shulker related chicken, one that drops shulker shells or ingredients to make a shulker shell. Or would that be too OP? Might I suggest some Ars Magica 2 chickens? Vinteum, liquid essence, and so on. I have had this idea, But the current system will need to change to be able to support this. Also I would have to come up with a system for skins for the custom chickens. Hey, I've been doing skyfactory 3 and I've been gettinga lot of random uranium chickens. Reasoning? It just started happening is it because they were on botonia flowers? That has nothing to do with it. also they shouldn't be randomly spawning. What version of SF3 are you on? while I personally feel this mod is a bit OP to offer things like Draconium production, on the other hand Draconium is otherwise something you can't obtain en masse (or at least not to the degree the mod demands for its high-end equipment and machines) without tearing up the world with a quarry or stripmining The End, neither of which is a good option if you're running a server like I am. I'm adding chickens, more chickens, and hatchery to my server's modpack for now, as I figure I can always remove or tweak them later down the road. speaking of tweaking this, can chickens added by this, and in particular the Draconium chickens, be disabled should I decide they're too "OP"? Excellent! In that case there should be absolutely no problem using this mod in my pack. I'll just tweak the drop times on emerald, Ender pearl, advanced Tcon alloys, and Draconium as I see fit :-). First off I love this mod, wish there was one for all vanilla animals!!!!! I've actually tried, the code is in there but for what ever reason its never worked. I have to try it again some time soon. How about an enchantment chicken?